The first Notre Dame App Challenge concluded on Wednesday, March 29, with presentations by each of the four final teams to the judging committee and the public in Mendoza’s Jordan Auditorium on campus. South Bend City Connect, an app aimed at reducing the additional cost of poverty for South Bend residents, took the top prize of $7,500. The idea for the app was created by graduate students Miriam Moore and Robbin Forsyth, who are both pursuing Master of Fine Arts (MFA) degrees in design. Formulating their app idea in September 2016, Moore and Forsyth were one of nearly 90 teams that submitted ideas for apps around the themes of “heal,” “unify,” and “enlighten” — words espoused by Rev. John I. Jenkins, C.S.C., president of the University, during an address to campus in 2011. The idea for South Bend City Connect was to connect residents of South Bend with city services such as utilities, banking, and public assistance, and to shift some of the strain on the city’s 311 call center to a mobile app. Moore and Forsyth also spent time at Stone Soup Community, a local resource that helps people struggling with poverty, to get a better sense for how the app could be most useful to the South Bend population. South Bend City Connect was chosen to advance to the second round of the App Challenge in October, where they received one-on-one coaching with experts in user interfaces, information security, and technical feasibility. They also created an “app blueprint” that contained all the details of how the app should look and operate. Round 2 culminated in a poster day in December; shortly after, South Bend City Connect was chosen to advance to Round 3 — one of just four teams out of the original 90. Moore and Forsyth were then paired up with student developers Erin Flynn and Ben Kennel, both undergraduates majoring in computer science. Flynn and Kennel worked with Moore and Forsyth to bring South Bend City Connect to life as a functioning Android app. While the other three apps in Round 3 were built for iOS devices like the iPhone, Moore and Forsyth recognized that most of the potential users of South Bend City Connect used Android devices. They are now working with the City of South Bend to pilot the app this summer. Each of the four presenting teams took home awards for their apps. What’s Up Doc is a mental health app that engages patients with daily surveys on their phone and plots trends over time to share with a doctor. The team that created this app took second place and received $2,000. ZEBRA is an app that facilitates community building among those affected by (and working to treat and cure) rare diseases. Its creators won third place and received $1,000. The fourth-place team created an app called Budget Books, which facilitates easier book rental for students receiving financial aid. This team received $500. Each app was built so that development can continue beyond the competition. Indeed, some teams have already sought to engage student developers to continue work. To provide the greatest flexibility for each team in the future, the App Challenge organizers also worked with the Office of Technology Transfer to ensure student teams retained all intellectual property rights. The App Challenge was sponsored by the Office of the Executive Vice President, and jointly coordinated by SAP, Innovation Park at Notre Dame, and the Office of Information Technologies. 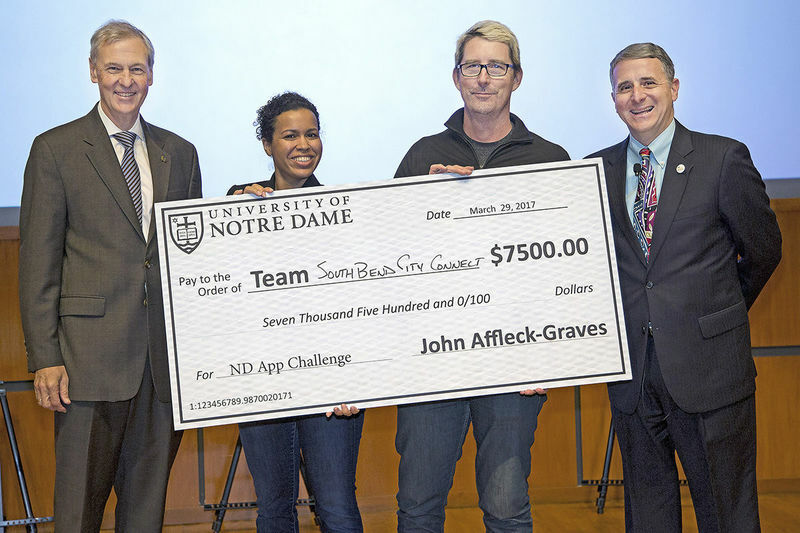 More information on the ND App Challenge can be found at http://mobile.nd.edu/appchallenge/. Originally published in ND Works. Originally published by Lenette Votava at al.nd.edu on April 21, 2017.